Welcome back to Creating in the Midst. This week Brooke Scott is joining us. She is maker, a mother, a poet, and a homeschool mom of five. 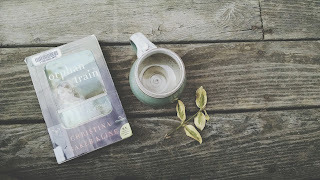 I've known Brooke for some time via her Instagram feed, and have fallen in love with her writing through her blog and recently published collaboration: Book of Hours, mamas edition. Thank you for being here, Brooke! ~Can you tell us a bit about your creative life? Before kids? After kids? Before children I worked at a bookbindery and as a studio assistant at a ceramics studio. When my husband and I were superintendents of condo buildings I was able to start and maintain a handmade fashion accessory business. A few years in to my business I thought adding a baby would be easy. Like everyone else I found it difficult. I tell the story of how I came back home from my first birth of how there were orders waiting on my fax machine (fax machine!). I am pretty sure I covered my eyes and started crying when I saw them. My business then shrunk and shrunk to be nonexistent. In the years following my focus was getting comfortable in my new mama skin. We immigrated to Canada when I was 6 months pregnant with our third child. To handle stress I began knitting and during the pregnancy with our fourth child began voraciously sewing. I find sewing calming. Working with my hands is a known quantity in a home with five children in various states of childhood. ~You mentioned in your email that you've only just begun writing in the last few years, what drew you to writing? In my teen years I wrote a music and personal zine with a friend. We sent it out all over the world and traded with other folks with similar interests. Writing the zine and receiving a positive response boosted me during those years. It was in my early 20's that I felt not interesting or smart or educated enough to continue writing for public consumption. I lost my nerve. Three years ago I decided enough was enough and started writing a blog. Meandering my way through blog posts I began to write poetry. I love expressing myself in a curated word count. It is a challenge for me. ~What does an average day look like at your house? Our days are long and cut up in to tiny bits. Our homeschool is inspired by Waldorf and I try to have a loose plan of our days, weeks and months. We are together doing lessons in the morning (currently grades 7,4,1 and fairy ring for our four year old) followed by an outdoor time. Living in the country is a relief for all of us. We all have space and quiet. I find morning a good time for me to plan, word dump or start a sewing project. Lunch draws us back together for the afternoon when I try to keep us home. The hardest part of homeschooling, I find is staying home! The smalls need as much home time as can be afforded so I work to protect it. Right before dinner is my golden time. I have made strides in what I am working earlier in the day so my progress panic is lower. I like to edit or finish sewing. I am pragmatic and more honest with myself at the end of the day. We eat, rush around doing chores and fill my husband in on the day before I shuffle off with the baby to bed. Early. Really early these days. Say 7:30 pm. I keep a pad of paper at the bedside and read till my baby is sleeping. Some night I have ideas, some not. I try to be realistic at night. We do not have wi-fi at the back of the house in the bedrooms and it is a blessing. My newest routine these past weeks since starting lessons up for the season is to sleep till 2 am. I get up, fuss around the house and set out notebooks or make lists for the older children's work the next day. If I can I like to watch some sort of BBC silliness and go to sleep. It's a funny routine but it has been working and I am not overtired. I am and have been working on a series of poems about a historical figure that is possibly fictional. The ambiguity is what drew me to him. He sounds too good to be true but how can you make that up! My two eldest sons are comic book readers and have influenced the pieces through their story recall. I also do a quarterly Tiny Letter newsletter. I am working on an essay about how having babies and toddlers for a decade can start to mess with your head and perspective. ~Do you create alongside your children? Yes! We inspire one another. ~Do you need absolute silence and space to write, or are you able to carve out moments throughout the day while in the middle of daily life? I'm a time whittler. With an under two and toddler time is not yet my own. ~What is the most challenging aspect of being a writer/maker/creative soul and a homeschooling parent? Burnout. If a candle could have more than two wicks I would be tempted to light them all. I am trying to head burnout off at the pass but I'm not able to yet. Over scheduling is my downfall every time. ~What is the most rewarding aspect? That little piece of me I know is under the dates scribbled on the calendar or that is forming a line in my head while sitting with a math problem and frustrated child. I am a better mama when I create because I have more to give. It is streamlined. Before we began lessons in earnest I was open to every possibility. Lace making! Baton twirling! Why limit myself? These day I am more realistic. And now... a few quickfire questions! ~What was the last book you read? I just finished Bryson's Dictionary of Troublesome Words and I just have to throw in what I am reading now. The Encyclopedia of Early Earth, a graphic novel by Isabel Greenberg and The Secret Chord by Geraldine Brooks. These are a perfect example of books I can't get enough of, sagas. ~The last project you worked on? ~If you had an entire day that was just yours, how would you spend it? Taping together PDF sewing patterns on my dining room table. The worlds most dreaded job with toddlers around. Brooke - thank you so much for your words, your insights and inspiration. So much of what you wrote resonates, I especially appreciate your routine, and that you find moments for your creativity, no matter the hour. I myself have trouble being flexible, and taking time as it's given to me if it doesn't look like what I imagine it to... It's been wonderful getting to know you a bit better, and I thank you for your honesty. Thanks, Corinne. It's a niche we all live in and it is nice to know others are there too!